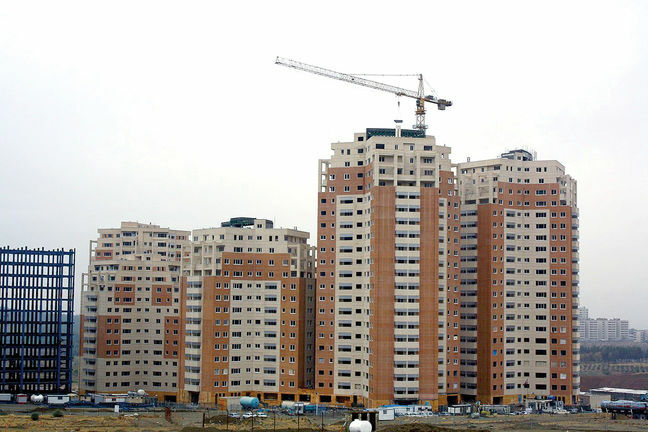 EghtesadOnline: Experts believe Iran's housing sector is already showing signs of sliding back into recession after enjoying only nine short months of booming activities. The main reason behind this is the significant jump in prices over the past few months due to fluctuations in foreign currency markets. The ailing housing sector went into what turned out to be its worst recession in recent history from 2013 and struggled to get out for more than five years. Experts have since identified a massive price surge in the two preceding years as the main reason behind the prolonged bout. The sector finally rebounded last year aided by government support that tried to make homes more affordable by offering cheap loans with long maturity periods at Bank Maskan, the agent bank of the housing sector. It entered a boom phase during the final quarter of the previous fiscal year that ended in March 2018, according to Financial Tribune. But around the same time, speculations that US President Donald Trump will withdraw from Iran's nuclear deal with world powers incited currency fluctuations that gradually grew worse and refuse to budge. The slide in the Iranian rial's value has translated into severe price hikes across all markets, including the housing market. According to housing expert Behrouz Maleki, a decline in bank interest rates last year also affected the housing market. "The money market is the most important competitor of the housing market in a way that redirection of liquidity between the housing market and the banking system is much stronger than that of the housing market and other markets," he told Fars News website. "Based on this, the money and housing markets exert undeniable influence on each other because housing and bank deposit accounts are alternative assets. Whenever yields in one dwindle, demand moves toward the other." In September 2017, the Central Bank of Iran doubled down on enforcing a previously approved ruling that capped long-term bank deposit interests at 15% from the previous 18% and beyond. That move shifted some of the money from banks to the housing sector, leading to the start of a gradual increase in prices. Official central bank data show that the volume of housing deals has steadily declined during the past three months while prices have continued to grow at massive rates up to 55%. Hesam Oqbaei, the deputy head of Tehran Association of Realtors, believes that the housing market can no longer take price surges of this magnitude, as people's already low purchasing power has dwindled further. "Price hikes of homes and any goods should be up to a reasonable level and an excessive price rise will surely lead to recession," he said. "So the housing market can't cope with more price jumps in the second half of the year [starting Sept. 23], as the surge in price has already reduced the purchasing power of people and will further push the recessive trajectory of the housing sector." Although home prices have climbed higher, they are still behind the inflation rate. The central bank on Tuesday put the inflation rate for the 12 months ending at the close of the fifth fiscal month on Aug. 22 at 11.5%. In fact, the past few months alone have seen prices of many goods see massive jumps of up to 200%. "Liquidity always moves easily and quickly toward consumer goods, so the housing market always keeps up with the inflation rate with a delay of one to two years and then goes past it," housing expert Mohsen Bahram-Ghaffari said. However, Hassan Mohtasham, a member of the board of the Iranian Association of Builders, believes that the sector can prevail, if the country manages to reach a state of stability after months of economic unrest. "If this happens, a portion of existing capitals will move toward the housing market, covering its gap with the inflation rate, but if this doesn't happen, we will be facing a situation where the demand side will hold things back," he said.